November, 2013 | Live Music in Athens Georgia! Happy Thanksgiving! I hope y’all have a safe and happy holiday. Michael’s niece Nina will open, definitely check out her fantastic voice. 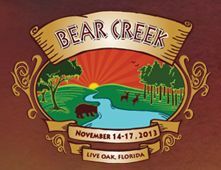 I still haven’t had time to update y’all on the Hulaween / Bear Creek shows but I have posted the final day of Bear Creek as a lot of my friends had to leave on Sun. and missed it. Check out Skerik’s Orchestra At Large for something different. I’ve also posted the All Star Jam from Sat night. LEFTY HATHAWAY High-energy, organ-driven blues and rock band. Performing every Wednesday in November. The Melting Point 8:30 p.m. $10 (adv. ), $15 (door). THANKSGIVING II A potluck and concert featuring Diego Catalan backed by Jason Trahan, Pete Erchick and Richard Mikulka, as well as sets from Joe Cat and Pipes You See, Pipes You Don’t. COSMIC CHARLIE Grateful Dead covers like you’ve never heard before. This is an “unplugged” acoustic show with special guest Jeremy Wegner on mandolin. MINA WEGNER Young singer-songwriter from Eugene, OR. The Melting Point 8 p.m. $8 (adv. ), $10 (door), $5 (w/ UGA ID). BEVERLY “GUITAR” WATKINS Renowned septuagenarian blues guitarist from Atlanta. TUESDAY NIGHT CONFESSIONAL Host Fester Hagood presents this week’s showcase of singer-songwriter talent, featuring Brother Shine White’s CD Release Party and Levi Lowrey. Tonight I’ll be at Kenosha Kid. I will try for Normaltown Flyers on Wed. Fri I’m definitely at Cosmic Charlie. I’ll try for OOGABOOGA SHUGA on Sat. Mon I’m definitely at Big C’s Blues Jam and Tues at Kenosha Kid.